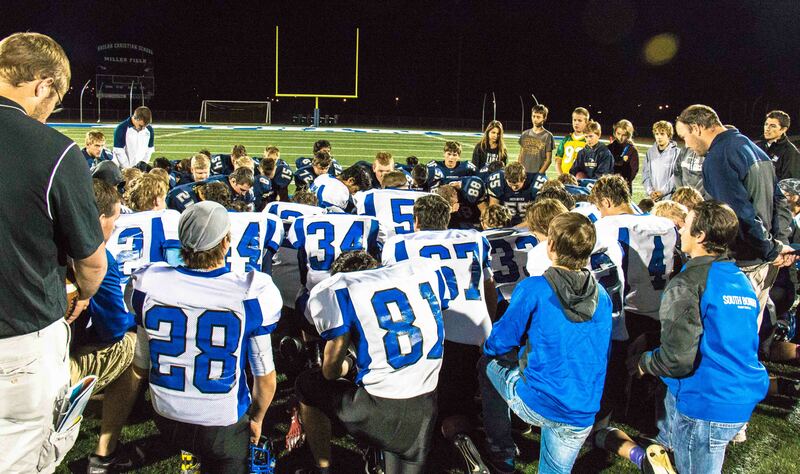 On Friday night, high school football ended for our son and his team. If there had been a series of upsets and wins, there was still a chance we could have somehow made the playoffs. But that didn’t happen. For the first time in eight years, the South Border Mustangs are not in the playoffs. We lost 50-24 to an undefeated Shiloh Christian. We played on their beautiful field in the big town of Bismarck, 100 miles from our rural, prairie home. It was an emotional night I had been dreading. The end of high school football. The first of many lasts of this senior year for our son, Hunter. My family was there and I didn’t feel sad as expected. A lifelong friend came with her family. Visiting and enjoying a fall evening as our last game gave me joy for the journey we have had through football. During the fourth quarter the Shiloh announcer said a couple of times that Shiloh’s team will meet in the middle of the field for a time of prayer and invited South Border and the student body to join them. As the clock ticked down, I grabbed my camera and asked our high school girls in the stands to join me on the field. 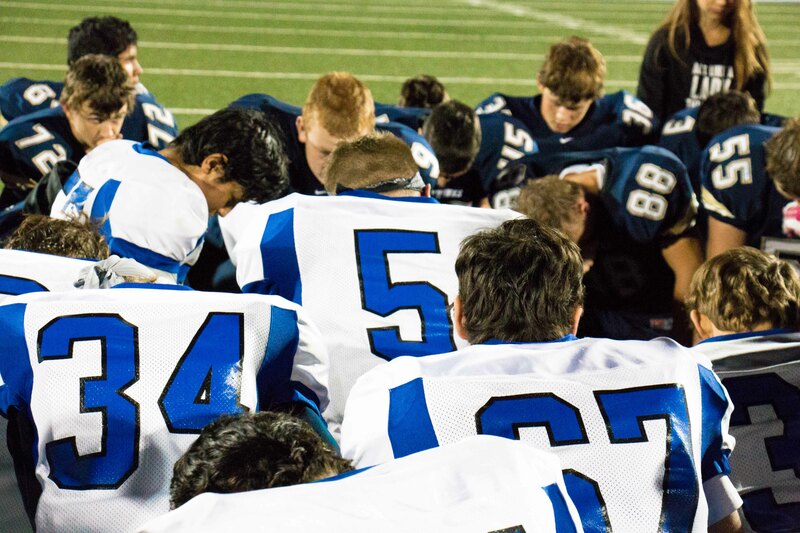 By the time we walked to the middle of the field, the prayer time had started. Shiloh prayed first and then stood up as it ended. Hunter, our son, said something and everyone went back down on their knees and into prayer again. This time, Hunter prayed. I couldn’t hear his words, only his voice as I stood back and looked at the moment from my camera. Anyone who has observed me as a parent in elementary, junior high and then high school sports has seen a change in me. I scream less and am calmer than I used to be. I’m still an intense mom but initially, I was focused on winning more than anything else. Last year in Wishek, where we live, a small group of students with adult supervisors and encouragers started the first Fellowship of Christian Athletes chapter that meets Monday mornings before school. Hunter is active in participating and leading the small group times. His college decision was impacted by examples of Christian coaches, how they live their lives and how it impacts their coaching. Next fall, Hunter will begin college at the University of North Dakota on football and academic scholarships. As high school football ended for Hunter, God reminded me He answered my prayer. Katie, my sons, Dawson and Canaan play for Shiloh. This post gave me goose bumps. May God continue to bless Hunter at UND. Thank you, Brandi for your comment and kind words. Blessings to you, your family and school! Thank you so much for sharing..this has been a blessing to so many ! Mrs. Ulmer I prayed for you when your accident happened! Thank you for commenting! Katie, your words brought tears to my eyes. We have a Freshman and 6th grader at Shiloh and they both joined the prayer. When we were on our ride home they only talked about Hunter’s prayer. Our 9th grader was moved by his words and she has spoken of him a few times this weekend. Today, while we were driving home from Church, I read your post to my family. We admire his skills on the football field but he impacted these young ones more by his words. God Bless you on your year of lasts (and firsts)! This comment means more to me than any touchdown! So thoughtful and I will share with Hunter. Thank you. Thank you for your words. They are a gift to many. I am a mom, HS teacher, coach, and Bible study leader for our high school kids in Rugby, so I see many sides to our children and their lives. I will be using this post to start our Bible study this week. God’s peace to you, Hunter, your family, and the SB Mustangs.